Need a space-saving way to furnish your dining room that also adds style and elegance to your home? 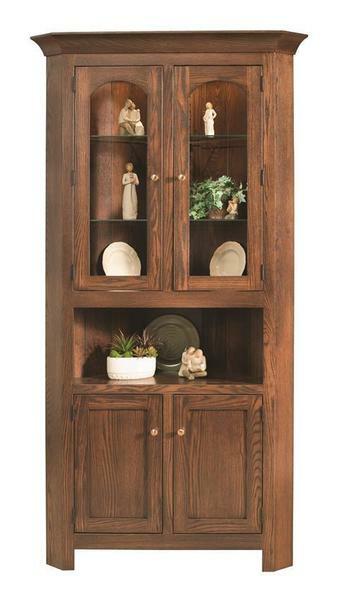 This stunning handcrafted Amish Georgetown Corner Hutch will provide just that and more. The corner cabinet design allows your hutch to fit snugly into the corner of any room, taking up minimal floor area and providing extra storage and display space. This gorgeous corner hutch is an heirloom quality piece that will become a part of your home and family for generations. The solid wood design is built with a complete dedication to durable and top-quality craftsmanship by our talented Amish woodworkers that craft each piece of furniture from premium North American hardwoods. Choose from nine high-quality hardwoods and a stain type for a custom look that will match your home decor and style preferences.